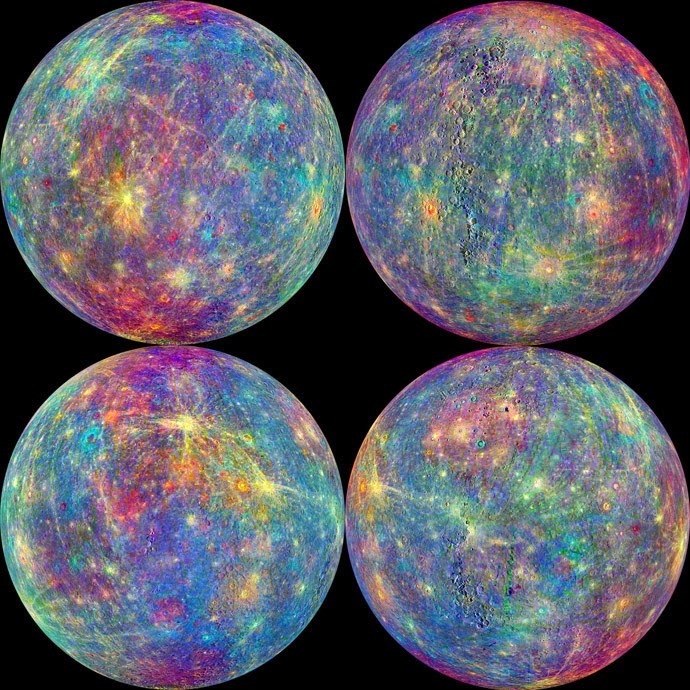 As Judgment Day approaches for NASA’s Messenger spacecraft, spectacular new pictures have appeared of the planet it is set to smash into on Thursday: Mercury. The unbelievable close-up shots show our solar system’s tiniest planet as never before. The mind-blowing look is explained by NASA covering the pictures from the spacecraft’s Visual and Infrared Spectrometer (Virs) onto a black and white montage in order to emphasize features such as craters and volcanic vents. After more than a decade since its take-off, and four years orbiting Mercury, Messenger will go where no other spacecraft has gone before on April 30th. After running out of fuel for its thrusters, the 500kg spacecraft is set to fall into the planet’s surface at some 8,750 miles per hour, fashioning its own considerable crater and destroying the probe itself. But the arrival looks set to be an anti-climactic one. Finding frozen water so near to the Sun was a main surprise, though there had been clues in earlier radar observations. Something was covering the ice, a mysterious dark coating. More study will be carried out but NASA is putting its money on it being carbon-rich compounds, alike to substances found in certain meteorites and in comets. To be precise, over the past four and a half billion years Mercury has contracted by over 7 kilometres in radius. A lot of data have yet to be examined. But for now, it’s a touching time for those whose jobs have revolved around the probe.